Following the earthquake, Japan received a total of 22.11 million yen (equal to about 34 billion yen today based on comparable rice prices) in monetary assistance from 30 countries. The United States immediately donated the enormous sum of more than 15.32 million yen (equal to 23.6 billion yen today). The victims and all the people of Japan were awed and deeply grateful for this generous act. President Coolidge had addressed the American nation and called for donations through the Red Cross. The nation responded. The U.K. was second with donations of 3.57 million yen (equal to 5.5 billion yen today). The people of the U.K. were extremely sympathetic and relief poured in from many parts of the country-the city of London alone donated 180,000 pounds. Unexpectedly, the next largest donor was China. Commented the Taisho Earthquake Journal, "China, our neighboring country with which we have had friendly relations, has experienced long periods of disturbance without a day of peace. But despite its plight, China extended their sympathy to us and donated the large sum of 1.377 million yen (equal to 2.06 billion yen today)." 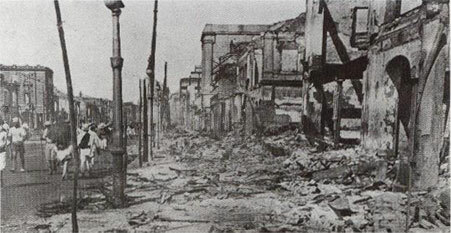 In less than a night, the Street of Ginza Dori, the most glamorous part of Tokyo, burned to the ground. The pitiful remains of the formerly splendid shops stand, resembling the ruins of Pompeii. The sunlight falling on the man and woman walking through the ruins is darkened by ashes and the dust of death. Not only did countries such as Holland, Belgium, France, Switzerland, Sweden and Italy send aid, but Peru, Mexico, Bolivia, Latvia and Chile responded as well which we find deeply moving. asked passersby to help "Save Japan" and sold paper cherry blossoms. Before long the city was full of people with cherry blossoms in their lapels. These actions reflect a heartfelt concern for another people's tragedy-a response that is hard to imagine in today's world. U.S. aid was prominent in two ways: its speed and its scale. Immediately after a telegram describing the disaster reached the U.S. on the evening of September 1, the U.S. government issued a telegraph of sympathy from President Coolidge and began drafting an aid policy. First a telegram was sent to the Philippine government asking that as much food and other relief supplies be shipped to Japan as soon as possible. The U.S. government then ordered the U.S. Asian naval fleet stationed near the China Sea to proceed at once to the earthquake disaster site and provide assistance. hospitals in Yokohama's Yamashita-cho and Tokyo's Tsukiji. It is also important to remember the heroic efforts of the U.S. Ambassador, Mr. Woods. Although his mother was injured in the earthquake, and he and his wife narrowly escaped disaster, he devoted himself tirelessly to the relief efforts, rallying the embassy staff and keeping in close contact with the U.S. government to expedite relief actions. When he left his post some time later, the entire nation expressed a deep-felt gratitude for all he had done.